Listen free on iTunes, Spreaker and Spotify for Deb and Samantha Fey’s informative and entertaining PsychicTeachers podcast. We offer psychic information, spiritual discussions and more! You also can hear archived shows free on iTunes where we are on the “Hot Podcasts List” and consistently in iTunes’ top 10 spiritual podcast list. We’ve been downloaded more than 4.2 million times and celebrate NINE YEARS on-air this year! 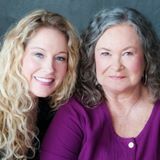 Connect with offerings from Deb and Samantha on Facebook too!